Knowing your horse is the key to endurance riding, according to the president of the club responsible for an early season event at Clareville on Sunday. Wairarapa Endurance and CTR Club held the early ride mainly to qualify young horses in the sport - before a rule change comes into force in August. Thirty-one riders from as far north as Maramarua and Reporoa and across to Otaki came to participate. Most of the riders and their horses - 19 of them, hit the road as early as 7am for the 40km ride - a frosty start to the day. There were half-a-dozen riders each for the 25km category and the 15km fun ride. President Shane Dougan said during the long training rides, "you really get to know your horse", and this becomes key during competitive events. "You've got to read your horse; you've got to know when to back off and when to push - there are a lot of tactics involved." He made his father proud. The 2013 World Champion of the 92 horse field for the seventh running of the World Endurance Championship for Junior & Young riders was 14-year old, Khalifa Ali Khalfan Al Jahouri, who won the Gold Medal on Niac Armor in the ride time of 06:34. Young Khalifa had the best of coaches, his father, rider and horse trainer, Ali Khlafan Al Jahouri, reigning European Open Endurance Champion. Especially of note for the win by this mare was that she is by the stallion, Fadasir, whose sire, Persik is an endurance legend, and especially well- known in this area of France. The twelve-year-old mare was bred by Olivier Yvon at Haras Les Chevaux d’Armor. Host nation France stormed to team gold at the FEI World Endurance Championships for Young Riders and Juniors 2013 in Tarbes at the weekend (July 27th), with 14-year-old Khalifa Ali Khalfan Al Jahouri (UAE) and Niac Armor clinching the individual title. Riders, horses and crews from 28 nations were tested in hot and humid conditions at the venue in the foothills of the Pyrenees, close to the world-famous pilgrimage site of Lourdes, where July temperatures are usually a moderate 24ºC. On the day of this year’s Championships, they peaked at 34ºC – just four degrees below the highest recorded temperature in Tarbes, but thanks to good horse management and sensible riding there was close to a 60% completion rate. With each continent of the world represented in the quality field, there was no knowing who would finally clinch the sought after podium positions, when the 86 combinations crossed the start line at 6.30 on Saturday morning. The track was made up of four loops with a wide variety of terrain and many challenges, all made even tougher by the soaring temperatures and humidity. On the 36.6 kilometre first loop, riders took advantage of the rolling track and cooler conditions to cover it at a good speed. Less than 3.5 minutes separated the top 30 horses at Vet Gate 1, with all athletes arriving within 30 minutes of the leaders. The UAE made their intentions for the day clear with their five riders in the top six, and the UAE’s Khalifa Ali Khalfan al Jahouri headed into the second 30.5km loop in the lead having covered the initial stage at 19.58kph. But with a much tougher stage ahead of him, it remained to be seen if he could hold onto the advantage. As the temperatures continued to rise, and on a hilly, stony track, 11 combinations failed to qualify for the third stage. The UAE continued to dominate, looking equally strong in the team competition, but with a number of other nations hot on their heels the competition was far from over. Loop 3 was considered the toughest of the day, measuring 32.1km, and in soaring temperatures (34ºC) and high humidity. The arrival into Vet Gate 3 saw a change in the leader. Quick presentation times were so influential throughout the day, and a speedy time here ensured that the sole Australian representatives, Erin Krahnen and Emily Jones TE, were first out on to the last loop, if only by a couple of seconds. The experienced 10-year-old grey mare, inched into the lead with just 21.1km to go on the final loop. Emily Jones TE is more often seen competing with Alexandra Toft (AUS) and the pair successfully completed last year’s Senior World Championships in Euston Park (GBR). Unfortunately for Toft, she had to withdraw her own mount from this year’s Championships prior to the event due to lameness and could only watch from the sidelines as her compatriot left on the final stage to battle for gold. The final loop was certainly competitive, with a front group of UAE horses setting a cracking pace. At this stage they still held top position in the team competition and, it seemed, were in line to take the individual honours too. Their dream however was not to be, however, when only one combination of the leading group passed the final vetting. Al Jahouri (UAE), who had been in the front running with Niac Armor from the very beginning, clinched the title, following in the footsteps of his father, Ali Khalfan Al Jahouri (UAE), who took victory in the Open European Championships in Florac (FRA) in 2011. It must have felt like a home-coming for the winning horse, the talented grey mare Niac Armor, which started its international career in France some years ago. The silver and bronze were still up for grabs and crowds waited excitedly at the finish line to see who would be claiming the next on the podium. The Dutch combination of Marijke Visser and her wonderfully consistent 10-year-old gelding Eomer took silver following a storming final loop at 23.4kph. This incredible pair finished 17th in the World Championships in Abu Dhabi (UAE) in 2011 and stepped up to fourth in last year’s European Championships in Mont-le-Soie (BEL). With the 2013 medal now in the bag, and with one year left as a Young Rider, she must be wondering if that elusive gold medal is on the cards next year when the European Championships moves to Italy. The final step on the podium was taken by Krahnen (AUS), whose mount Emily Jones TE also took the coveted Best Condition title. The pair held onto third despite Oriana Ricca (URU) with Talita Kumi 50 and Kelsey Russell (USA) on My Wild Irish Gold closing in on the final stages but ultimately, Ricca and Russell had to settle for fourth and fifth. The team competition was, as always, hotly fought and in the end saw a replica of the 2010 European Championship podium, with France scooping team gold yet again, followed some distance behind by Belgium (silver) and Spain (bronze). 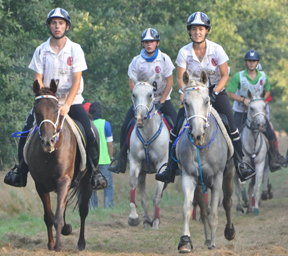 The 2013 edition of the FEI World Endurance Championships for Young Riders and Juniors saw the initiation of a new formula for the team competition. All Nations can now enter five athletes without the need to declare a team. The top three positions from the five count for the team score – but now medals are only medals are awarded to the three athletes whose scores have contributed to the final result. It was a family affair for the home squad, as Roman and Morgane Lafaure came across the line in sixth and seventh, followed closely in ninth by compatriot Robin Cornely, ensuring that France remained supreme, and now holds both the European and World titles. Their total time of just 19:44:49 put them almost one hour ahead of Belgians (Olivia Antoine, Louna Schuiten and Raphael Van Cauter), who finished just 10 minutes ahead of bronze medallists Spain (Agda Muixi Crusellas, Cristina Yebra Altimiras and Yvette Pi Masnou). FEI Endurance Director Ian Williams praised the management of the horses throughout the day and was very pleased with the level of the competition: “This Championship was technically challenging, both in terms of the track and the weather conditions we were faced with, but it was a real privilege to see the youth of our sport caring for their horses so well and producing such great results”. FEI World Endurance Championships for Young Riders and Juniors 2013 – Teams: GOLD – France, 19:44:49 – Petra Cabirat (Roman Lafaure); Rhial Cabirat (Morgane Lafaure); Rusty James (Robin Cornely); SILVER – Belgium, 20:40:22 – Wigor ZA (Olivia Antoine), Nasrik de Rendpeine (Louna Schuiten), Okba de Chaussy (Raphael Van Cauter); BRONZE – Spain, 20:50:32 – Oursai de Oassa (Agda Muixi Crusellas), Calzadilla (Cristina Yebra Altimiras), Pink Floid (Yvette Pi Masnou). FEI World Endurance Championships for Young Riders and Juniors 2013 – Individuals: GOLD – Niac Armor (Khalifa Ali Khalfan Al Jahouri) UAE, 06:00:34; SILVER – Eomer (Marijke Visser) NED, 06:13:05; BRONZE – Emily Jones TE (Erin Krahnen) AUS, 06:21:10. Emily Jones TE, under Australia's Erin Krahnen, won the Best Condition Award in Tarbes, France yesterday. TE Emily Jones is bred and trained by Peter, Penny, and Ali Toft of Toft Endurance. 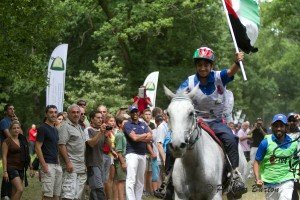 UAE’s endurance prodigy and gold medallist Khalifa Ali Khalfan Al Jahouri followed in the footsteps of his father, Ali Khalfan Al Jahouri, a former European Open Endurance Champion, after the teenager won the seventh leg of the 120-km FEI World Endurance Championship for Junior & Young riders at Tarbes Stud Farm in Southern France on Saturday. The event was sponsored by the Shaikh Mansour bin Zayed Al Nahyan Global Arabian Horse Racing Festial under the directives of Shaikh Mansour bin Zayed Al Nahyan, Deputy Prime Minister and Minister of Presidential Affairs. The brilliant performer left 91 international contenders behind his back to put his 12-year-old Arabian mare Niac Armor on top gear and stormed home unchallenged. “I’m truly delighted to see a new generation of UAE riders winning such huge international event. Khalfan gave his mare a great ride and she has been trotting keenly all the way. I think there’s much work that has been done to keep the mare in a sound condition after her trip from our headquarters in Abu Dhabi to France. But, at last everything went according to plan,” a jubilant endurance trainer Ali Khalfan Al Jahouri said later. Meanwhile, 92 riders aged 14-21 from 28 countries have assembled to battle for the title of the grueling ride in Southwestern France. “This is a great moment in my life and career and represents a promising start at the international level,” the brilliant rider said in a post race chat. “I have been keeping trying and my father has been always supporting me. He’s too patient and tough at the same time. I would like to thank him for availing me the opportunity to display my skills as a rider and for preparing this lovely mare for the competition. It was a tough race and the speed was very high. My mare was always surprising me and I didn’t feel at any stage that she’s going to be beaten,” he said. Mrijke Visser, astride Eomer, finished second to claim the silver as the Australian contender Erin Krahnen aboard Emily Jones TE walked away with the third place honours and the bronze medal. Then came Uruguay’s Oriana Ricca and USA’s Kelsey Russell. Lara Sawaya, director of the Shaikh Mansour bin Zayed Al Nahyan Global Arabian Horse Flat Racing Festival and head of the International Federation of Arabian Horse Racing Authorities ( IFAHR) Ladies Racing thanked Shaikh Mansour for his support of Arabian racing and endurance. “We appreciate Shaikh Mansour’s initiative and directives to sponsor this event that brought the juniors and youngsters of the world under one roof to promote the Arabian horse riding and racing,” she said. “The Shaikh Mansour bin Zayed Al Nahyan Global Arabian Horse Flat Racing Festival will now be the major sponsor of the September 26-29, Garda Endurance Cup & Italian Championships, the FEI World Endurance Championships for Young Horses at Valeggio Sul Mincio, Italy,” she confirmed. “There’s also more pleasant news to come in respect of the activities during the next season which marks the fifth anniversary of the World Arabian Racing Conference 2014, to be held in London,” she added. The UAE's Khalifa Ali Khalifan Al Jahouri won the 120-km**** Young Rider Junior World Endurance Championship in Tarbes, France today in 6:00.34, 12 minutes 31 seconds ahead of second place rider, Marijke Visser of the Netherlands, riding Eomer. Australia's Erin Krahnen riding Emily Jones TE took the bronze medal in 6:21.10. Uruguay's Oriana Ricca riding Talita Kumi 50 finished 4th, in 6:21.10. USA riders Kelsey Russell and My Wild Irish Gold, and Christina Kimery and Wallace Hill Shade completed the WEC. Russell finished in 5th place in 6:28.47, 28 minutes behind the winner, averaging 18.519 km/h. Kimery finished in 41st place, 2:18.56 behind the winner, averaging 14.414 km/h. 3 USA riders were eliminated on course: Katherine Gardener and AF Big Bucks at Gate 3 for lameness; Mary Katherine Clark and Chasing the Wind at gate 2 for lameness; and Sarah Jack and FYF Dutch at gate 1 for lameness. Clark's horse lost a shoe on loop 1 and was sore. 1st Place: France; 2nd Place Belgium; 3rd Place Spain; 4th Place Malaysia. 49 of 86 riders completed the course. It was described as a "tough technical trail, with mud and rocks." The 5 USA Team horses trotted out for the Vet Inspection for the Junior Young Rider World Endurance Championship in Tarbes, France today. All the horses passed inspection. Riders will be: Kelsey Russell, Christina Kimery, Sarah Jack, Katherine Gardener, and Mary Katherine Clark. The race begins tomorrow at 6:30 AM (France time - 11:30 PM West Coast Time). My Wild Irish Gold, owner Valerie Kanavy. Runner is John Crandell. Rider #90 is Kelsey Russell. Trot VIDEO of Wallace Hill Shade, owner Amy Whelan, runner is Jeremy Olson. Rider #89 is Christina Kimery. Trot VIDEO of FYF Dutch, owner/breeder/runner - Nicki Meuten. Rider #88 is Sarah Jack. Trot VIDEO of AF Big Bucks, owner Pam Weidel, runner Jeff Gardener. Rider #87 is Katherine Gardener. Trot VIDEO of Chasing the Wind, runner and owner is Mustafa Tehrani. Rider #86 is Mary Katherine Clark. The "longest, toughest, horse race in the world" is coming up, August 4-14, 2013, the Mongol Derby, a 1000-km multi-horse race across the Mongolian steppe. It's a recreation of Genghis Khan's legendary postal system. Pre-race training will take place August 1-3, and the race will start August 4th. The race is expected to end August 13-14. US endurance riders Lynne Gilbert and Devan Horn, and former-US-now-French endurance rider Sandra Fretelliere will participate. Opening Ceremonies for the Junior Young Rider World Endurance Championships will take place today in Tarbes, France. 91 riders from 26 countries will participate. The 120-km**** race will begin Saturday, July 27th at 7 AM. A round-table meeting called by the FEI on endurance has mapped out a strategy for the discipline, but only time will tell whether it will ease tensions over worrying levels of drug infractions and injuries in the Middle East. The world governing body for equestrian sport said Wednesday’s meeting at its headquarters in Lausanne, Switzerland, achieved unanimous support for a strategy mapped out for endurance by the FEI. Trevor Walton knows all about endurance riding. The 71-year-old is a national champion in his chosen sport, receiving the award at a special function in Christchurch last Saturday night. There's no engine power, just good old horse power with Walton claiming the New Zealand endurance title on his 12-year-old Arab gelding, Lotus Blue Moon. Walton, who has a block of land near Bell Block, had the best points tally in the national series, beating competitors young enough to be his grandchildren. Riders had to compete in at least five races in the series, over distances between 40km and 79km. A 14-YEAR-OLD has joined 50 horse riders on an epic trek across the National Forest to raise £1,500 to beat cancer. Abbie Mae Trayford, who attends Abbot Beyne high school, was given the challenge by Kathryn Parker, the school’s library assistant, after the pupil’s mother was diagnosed with lung cancer. 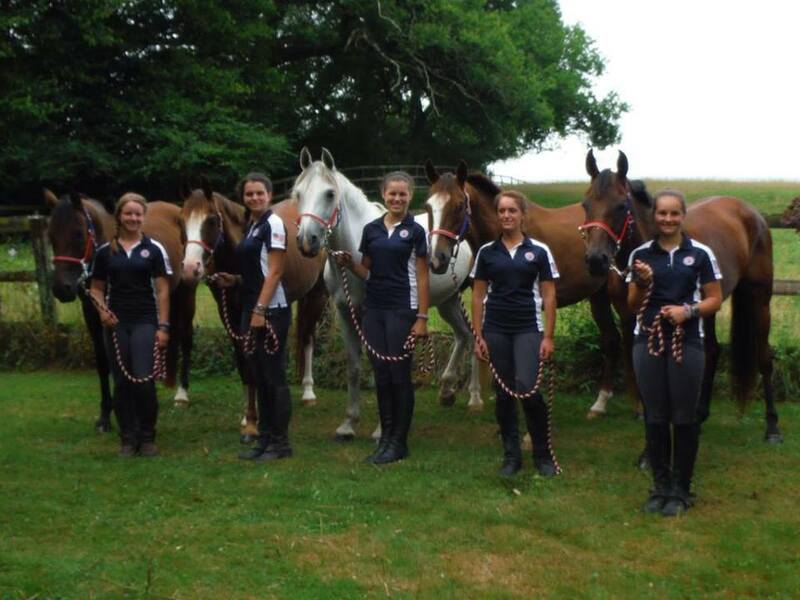 After months of planning and advertising for riders, Mrs Parker, Abbie and friends -Marissa Golding and Holly Lindsey, along with 50 riders and their horses took part in a 12-mile Long Distance Horse Ride. Mrs Parker said: “It came about as I know Abbie has an interest in horses and her mother suffers from lung cancer. I thought what can we do to entertain Abbie at this time? LEXINGTON, KENTRUCKY - LEXINGTON, KTY.. – Flesherton's Emma Webb won two silver medals at the North American Junior Young Riders Championship's endurance division on Friday. The 19-year-old Webb rode Vagas in the 120-km race against the top riders in North America, claiming the individual silver with a time of 7:29.40. Webb also led Team Canada – which included Alberta's Jessica Yavis on Jahlad (8:33.11) and Jaylene Janzen on Sakic (9:42.51) – to a silver medal. Canada finished with a total time of 25:45.42. Kate Atkinson showed she has the endurance to succeed after she was selected to represent Great Britain at the 2013 FEI World Young Rider Endurance Championships in Tarbes, France at the weekend. The 15-year-old from Burnley will tackle the tough 125km course in the foothills of the Pyrenees riding her own and her mother Rachael Atkinson’s horse, Oakthwaite Samara. The five strong British team for the Championships was chosen after a hotly contested team selection trial held on the 16th June at the Endurance GB Wimpole Way ride in Cambridgeshire. SOME trainers are refusing to vaccinate their horses against Hendra, because vaccinated horses will not be accepted into export markets. Countries including the United Arab Emirates, Hong Kong and Singapore have closed their borders to Hendra-vaccinated horses because blood tests show up as Hendra positive. Warwick showjumper Dave Goodwin is about to take his top horse to Europe where he may go on to compete in the UAE. "I wasn't going to vaccinate him because I'm going travelling with him and I didn't want to worry about travel delays," he said. Mr Goodwin sells horses to China and Japan where a good horse will sell for between $50,000 and $100,000. As President of the American Endurance Ride Conference (AERC), and at the direction of our Board of Directors, this letter serves as a request that the United States Equestrian Federation (USEF) submit a letter to the Federation Equestrian International (FEI) in regards to increasing concerns regarding Endurance at the international level; and specifically as support for the letters publically issued by Equestrian Federations of Belgium (October 2, 2012), France (October 12, 2012) and Switzerland (March 26, 2013). We share the alarm voiced by the European federations of Belgium, France, and Switzerland in regards to profoundly disturbing evidence of deficiencies in horse welfare issues; including an increase in equine fatalities, orthopedic injuries and serious drug violations. We note that these letters have been widely circulated throughout world press, and that the reputation of the sport and all those federations involved is likely to become irreparably tainted if decisive action is not taken at once to resolve these issues. The AERC prides itself on our motto, “To Finish is To Win”, which illustrates our uncompromising bedrock principles that welfare of the horse must remain of paramount importance and never become subordinate to an attitude of “win at all costs”. We are further disturbed that AERC’s cornerstone principle of remaining a drug-free sport has in recent years deteriorated at the international level to the extent that FEI Endurance has the highest number of violations of anti-doping rules, specifically in regards to teams originating from the Middle East. We support these principles, in which the health and welfare of our equine athletes is held as primary importance. As such, it is of the highest priority that the rules previously set in place to support these values be consistently and strenuously upheld, regardless of the influence and financial sponsorship of one or more individuals involved as competitors, owners of vast racing stables, and/or as elected officials within the highest echelons of FEI. A failure to do so on the part of FEI threatens the integrity of the entire sport, but most especially endurance racing at its top international levels. In addition to the above issues, AERC is alarmed about the increasing speed requirements in order to obtain a Certificate of Capability. It is understood that endurance events are a race, and therefore the winning horse and rider is by definition those who complete the course in the fastest elapsed time. However, we are dismayed that FEI endurance has evolved from its prototypical roots of challenging, technical courses requiring advanced horsemanship, strategy and judgment to a long distance flat race where horsemanship is subordinate to speed and speed alone. While we understand the desire expressed by some individuals to make endurance a more spectator-friendly sport, such choices in course design and venues also encourage racing at unsafe speeds on the flat courses. It is therefore of little surprise that the incidence and types of injuries and fractures within FEI Endurance now approach those observed in traditional flat-track racing. Specifically in 2010, a peer-reviewed scientific journal, Equine Veterinary Education, documented musculoskeletal injury rates of one limb fracture per 236 FEI starts in the 2007-2008 European endurance season. We note that articles in highly respected publications such as the New York Times detailing drug rule violations and catastrophic injuries within flat-track racing has resulted in increased scrutiny and negative perceptions by the public, animal welfare groups and governmental agencies. Additionally, the New York Times has even detailed official blatant partiality to certain Middle East nation teams at FEI's highest level (world) competitions. Should FEI fail to take decisive action to correct the current serious deficiencies within the federation and Endurance discipline, we cannot help but predict a similar fate for the entire sport of endurance. It is therefore AERC’s request that USEF add their strenuous support to those federations which have previously expressed their concern over the current state of horse welfare issues in the Endurance discipline. We look forward to working with you on this very important issue. The definite entries have been announced for the FEI Young Rider & Junior World Championship to be held in Tarbes, France, on July 27, 2013. 91 riders from 26 countries are scheduled to be on the starting line for the CEI4* 120 km race. 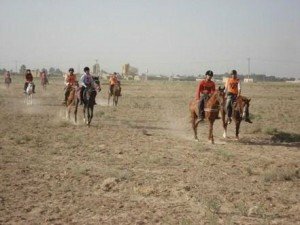 July 15, 2013, Report from Iran thanks to Shirin Salartash - Iran has had organized Endurance Riding since 1997 and in 2012, after approving the National Endurance Regulations, every season there is one National ride; team and individual and in the winter, and there will be an Iranian Endurance Championship. During the year the provinces and private clubs organize their rides in their own region. The distance for the novice riders and horses start from 20k, after that one 40k and then the combination of the horse and the rider are qualified for 60k, which is also in the National rides. In 2012 we had 60 and 80 k and this year the in first National ride, with riders competing in two distances : 60 and 80k as well. ON the hottest day of the year so far, most sane people were taking it easy in the shade with the Sunday papers and a cold drink to hand. Not the 70-odd riders who took to the hills around Broughton on the third day of the endurance festival that has become a flagship event for the Scottish Endurance Riding Club. Based at Corstane Farm, the event attracted more than 230 entries from all over Scotland and the north of England. Starting with a leisurely pleasure ride on Friday evening along the old railway line to Biggar, riders really kicked into gear on Saturday morning. Classes ranged from 80kms over two days to another two different pleasure routes. Paris, July 14(ONA) ----Six of the Royal Cavalry horse riders cruised for the third time to the world endurance championship in 2014 to be held in France. The championship will be organized by the International Equestrian Federation. Abdullah bin Said al-Siyabi on Punjab, after passing the stages of the 120 km British Royal Windsor race. Brig. Abdulrazak bin Abdulqadir al Shahwarzi, Commander of the Royal Cavalry affirmed that this achievement has been accomplished through a plan outlined by the Royal Cavalry for its riders to participate and compete in the World endurance Championship through a program prepared especially for this purpose, particularly after the great world achievement made by the Royal Cavalry in World endurance Championship in 2012 , held in Britain as its riders won the third place at the world level with the bronze medal. He added that the Royal Cavalry will seek to train another group of riders and horses alongside with riders already qualified to be on the substitute list of the team through their participation in races organized by the International Equestrian Federation, such as the Europe's endurance Championship 2013 to be held in the Czech Republic in September. He concluded that this achievement came with the support of the Secretary General of the Royal Court Affairs who is always keen to follow the team in its various participations. It should be noted that Florac race, held in Southern France is one of the most difficult races faced by the riders of the Royal Cavalry due to the difficult topography of the region for different slopes as 56 horses participated in the race and 14 horses qualified, including two from the Royal Cavalry. 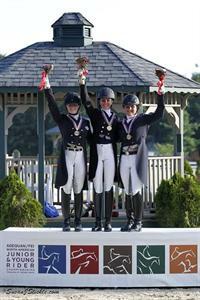 The United States Equestrian Federation (USEF) has announced the horse and rider combinations to represent the U.S. at the FEI World Endurance Championship for Juniors and Young Riders, July 27, 2013 in Tarbes, France. The following horse-and-rider combinations have been named by the United States Equestrian Federation (USEF) to represent the U.S. at the FEI World Endurance Championship for Juniors and Young Riders, July 27, 2013 in Tarbes, France. HUMBLE, Texas -- Devan Horn, 20, is a senior Criminal Justice major at Sam Houston State considering a path that will take her to law school. But the path she’s already traveled, on horseback, is taking her around the world. Horn, who trains daily at the Cypress Trails Equestrian Center in Humble just north of Bush Intercontinental Airport, has been competing in equine endurance races since the age of 10. Competitions have taken her throughout the United States and as far away as the United Kingdom, the United Arab Emirates and Australia. She’s traveled more than 3,000 miles total on horseback in 55 events. But the next 650 miles will be the toughest. "I don't have any idea how my body is going to react when I go past 200 miles,” Horn said. “I have no idea if my body is going to be able to withstand it..."
HORSE died at a property west of Kempsey on Friday night after contracting the Hendra virus. Kempsey veterinarian Andrew Bennett yesterday confirmed laboratory tests on samples from the horse tested positive to the virus. The veterinarian that took samples from the horse, the veterinarian that handled the samples and the owner of the horse have all been contacted by the Department of Health for risk assessment. A second horse on the property was to be tested yesterday by the district veterinarian. 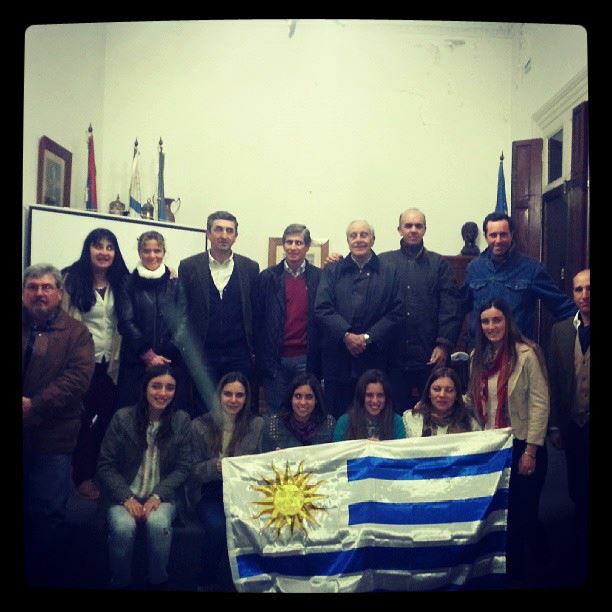 The Sports World Equestrian Resistance Uruguay, is celebrating the departure of their National Young Riders Raid, that on July 27, 2013, will defend the pavilion Celeste in the French city of Tarbes. Making her delivery of your banner Junior National Team (in this case composed entire females), lay off this team that will defend its colors Celestial, but earlier in the day tomorrow, held a party with barbecue and lively with music and singing, to raise funds to defray the expenses of such selection. Good luck in the World Cup. RIDERS were treated to magnificent weather conditions for the 23rd annual Kundabung Endurance Ride on the weekend. The event attracted more than 70 riders who travelled from as far Sydney and two hours south of the Queensland border. 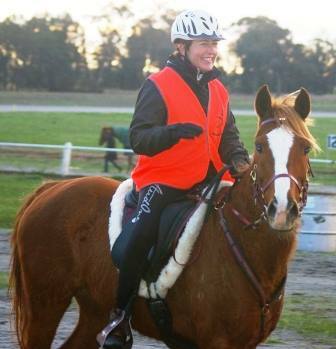 Zone Six Endurance Riders Club member and NSW Committee member Mary Lou Locke said fresh faces competed in this year’s event. “It is something you can get hooked on,” Mrs Locke, who has been riding horses for more than 20 years said. 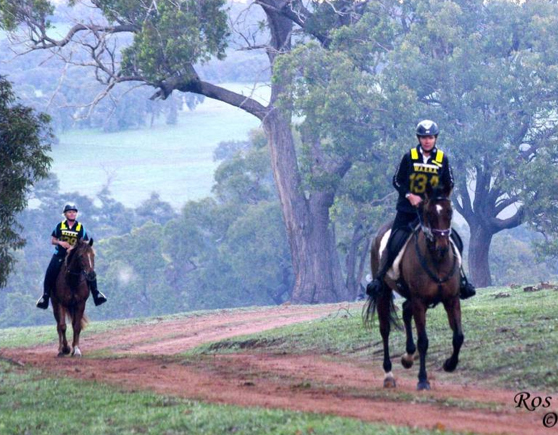 THE Gingin Endurance Horse Ride held on June 15 was a great success. Once again the peace and quiet of Gingin town was disturbed by the rumble of floats and horse trucks of all shapes and sizes as they drove through the main street and headed up Cheriton Valley to the ride base at Jarrah Downs. A total of 97 horses and riders entered the three rides - the 20 kilometre social ride, the 40km training ride and the 80km endurance ride. About half of the riders had not been to an endurance ride before and it was wonderful to see so many new faces. Riders came from as far afield as Denmark, Yerecoin and Geraldton. 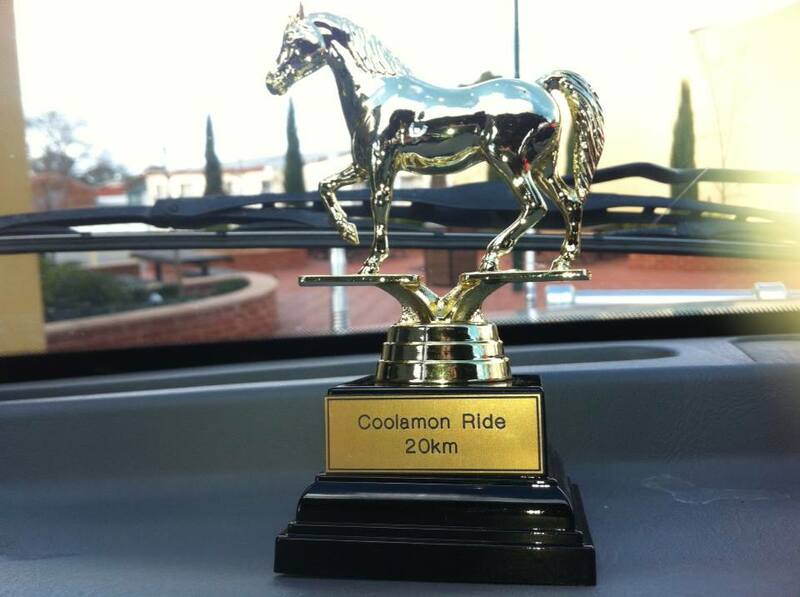 Several local people entered the ride and a few pony clubbers completed the 40km ride for their 'K' certificate. As for the horses, they came in all shapes and sizes and all ages. The well attended 20km social ride was an easy pleasant ride and there was only one early pre-ride vet out. However, the 80km ride was considered a tough and challenging ride because of the hills and the sand. photo: Penny Amond on board Rosie’s Brown Sugar. BROMSGROVE endurance rider Penny Amond has been selected as reserve for the British Young Rider Team at the 2013 FEI World Young Rider Endurance Championships which takes place in France later this month. Amond, who is 18, and her Appaloosa horse ‘Rosie’s Brown Sugar’ will travel to the foothills of the Pyrenees for the championships. She was selected after a hotly contested team trial which took place in June at Endurance GB’s Wimpole Way ride in Cambridgeshire. Last year, she rode Rosie’s Brown Sugar to second spot at the FEI ride at Euston Park in Suffolk. They have also represented the Heart of England and Cotswolds Endurance team on several occasions. Amond is currently studying Horse Management at Hartpury College in Gloucestershire and plans to embark on a degree course in Equine Business Management this September.